You might be wondering why I’m writing about where I go grocery shopping, right? Good question! The reason is simple: as part of my blogging, I see myself as an educator about science and medicine. As they become increasingly complex, it’s harder for the public to understand what’s important, what’s real, what’s junk, etc. Also, as a passionate believer in the value of science and the scientific method, I am saddened and worried by the misinformation and myths that abound, especially on social media. That’s why I write occasional articles current topics in science, medicine, and how they apply in our daily lives, just like I do about dentistry. The most important point that I try to make in all of these articles is that real science has to follow strict rules, whereas pseudoscience and alternative medicine can pretty much make up anything they like. Sadly, we’re seeing a lot of the latter in current discussions about organic and GMO foods. 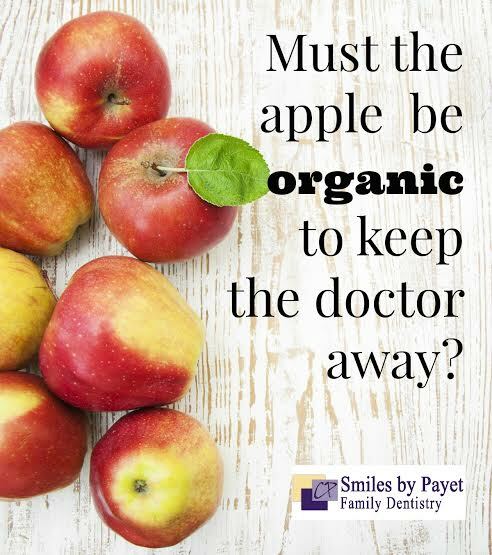 As a dentist, I can obviously afford the higher prices of organic food – I choose not to do so. I have no tolerance for conspiracy theories. If your primary argument against GMO foods is “Monsanto is evil,” you’ve already lost, because that’s just childish. [Update 5/20/2016] The National Academies of Science, Engineering, and Medicine just released a 420-page report that fully vindicates GMOs as being safe for humans and animals alike, although they also indicate that GMOs have not completely lived up to the hype, so there is still room for improvement. I am adding this as an update here so it can easily be found. At the bottom of the article is a link where you can download the entire report as a PDF for free. Growing up in the ’70s, ’80s, and ’90s, there was no question of GMO vs. organic. It was all just “food.” But around 2011-2012, as social media such as FB, Twitter, etc. grew and messages spread rapidly, I began seeing anti-Monsanto memes, memes about glyphosate and Roundup, growth hormones and steroids and antibiotics, claims of organic foods being healthier, etc. I absorbed a bit of the fear and started purchasing organic foods. After moving to south Charlotte in 2013, suddenly Fresh Market was convenient, so I bought a lot more organic. My wife wasn’t happy about the jump in our grocery bill, but I told her it was worth the benefits and we could afford it, so we should. But really, it was all based on some vague, uninformed fears and no real information or science. In retrospect, I’m embarrassed at my lack of critical thinking and blind acceptance. By early 2014, however, I became suspicious of the rhetoric and claims being thrown around by supporters of organic foods, which prompted me to “do my research,” as the online saying goes. What I ultimately found, however, was that the “superiority” claims made by organic supporters were overblown, while the “evil” stuff about Monsanto, GMOs, etc. were easily debunked as non-existent or bad science. The harder I looked, the case for organic came down to “we don’t like yucky stuff and only want natural!” And despite all the monstrous claims about how untested GMOs are, how they can “get into your genes,” how Monsanto is a demonic company (one of my own cousins made the statement that Monsanto is worse than the Nazis)….once the real science was examined, I found that GMOs are the most-tested and safest foods in history! Not only that, I became increasingly aware of how “Big Organic” uses deception and misinformation to mislead the public. As should be the case when anyone finds their own position thoroughly unsupported by evidence, I admitted that I was wrong and changed my mind. Unless a claim is backed by research, it’s meaningless. Why? Because without research that can be examined and replicated by others, anyone can say absolutely anything. Here’s more on Why Research Beats Anecdote, and here’s an article I wrote after reading a mind-stretching book, Review of “Thinking, Fast & Slow” by Daniel Kahneman that touches on the subject directly. Unless the person making the claim is actually qualified to know what the heck they’re talking about, or unless their claims are supported by people who are so qualified, those claims are worthless. Compare her with Professor Kevin Folta, a full-time faculty member who has published many studies, teaches the material, and knows it inside and out. I would defer to his knowledge over my own every day because he knows it! Sure, dentists study a lot of medical subjects, but if I have a heart problem, do I go to another dentist? Of course not! I go to a cardiologist who actually knows what the heck he’s talking about. I certainly don’t go to some unqualified person on the Internet who has a degree from Google University. I have no patience with conspiracy theories because they never apply even their own lousy standards to their own arguments, which makes them (again) meaningless. There is a very good reason why Understanding Logical Fallacies is crucial to meaningful discussion. Single studies are worth very little. Lots of studies turn out to be wrong or need their conclusions modified once more data is gathered. Large numbers of high-quality studies are necessary to slowly sift the wheat from the chaff over a long period of time. Besides learning that the real science of GMO foods is unbelievably strong, what my research turned up was a number of myths, misconceptions, and outright lies about organic farming and foods. And even worse, I realized that many of the pro “Big Organic” social media outlets are willing to lie and manipulate to frighten the public. I know that’s what you get with Freedom of Speech, but when did it become OK to outright LIE? I guess that goes back to the Big Tobacco fights, as has been well-documented in the Merchants of Doubt movie. But here are a few of the myths that turned me away from organic, as well as the Organic Marketing Report (click to download a full report)that is well worth reading. Just today, while continuing my research, I found this article in the New Yorker, written in November of 2013, about why the CEO of Climate Corporation sold it to Monsanto, allegedly the “most evil company in the world.” Why the Climate Corporation Sold Itself to Monsanto It is a powerfully written, thoughtful, and excellent article, including an email from that CEO, David Friedberg, about how much work he put into making sure it was the right choice. As I mentioned in my article on water fluoridation, I regularly refer to this graphic to help understand the differences between good science and bad, which will help you understand why I recommend the following list of reputable resources about the safety of our food. Want to Know About Food? Talk to Farmers! I don’t know why I’d never thought of it before, but doesn’t this make sense? Well, at some point in 2014, I also began connecting with some farmers and farmers’ wives on FB who blog about farming and let me tell you, that really opened my eyes! Let me share with you a few really helpful women who live and breathe farming every day and who regularly share what farming is really about. Sarah is a nurse who fell in love with and married a 4th generation farmer. They are raising their two boys on their acreage as well as farming 6300 acres of wheat, canola and yellow peas in the heart of Wheatland County, Alberta. Sarah has a passion for photography, cooking and baking and agriculture. She also helps run the “Ask the Farmers” program, where you can ask any question about farming and get an answer from a real farmer or researcher. Jenny is the Prairie Californian: Country girl at heart. Daughter of a butcher. Wife of a farmer. Self-proclaimed home cook. California born, she followed her heart and her dreams to North Dakota. Now she is cultivating a legacy of family, food, and farming on the rural prairies of North Dakota. Amanda is the proud daughter (and sister!) of conventional farmers in Southwest Michigan as well as a practicing attorney. For 26 years, her family ran and supplied a roadside market selling our own fresh fruits and vegetables. They now farm corn and soybeans. Now her goal is to help educate consumers about conventional farming and give people a glimpse into how our food is raised and why certain production methods are used. It’s amazing what you can learn when you talk to the people who actually know the stuff, and I find it hilariously sad when people who’ve clearly never done ANYTHING in farming start sounding off as if they’re experts. Yeah, RIGHT. Like I mentioned earlier, you wouldn’t go to a dentist to fix your computer network problems, or a network guy to ask about cardiac surgery, or a car mechanic to know about lab chemistry…but that’s what happens with people and their degrees from Google University. Please….say no to nonsense and actually learn the facts from the people who know them. Want to know about food? Ask the people who grow it! OK – I’m done! Sound off in the comments – what do you think? Bear in mind that any abusive or disrespectful comments will not be tolerated. We can disagree politely. 🙂 And if you want to be taken seriously, please provide reputable evidence. Anecdotes really don’t count. Editorial Comment: over time, as I come across additional good articles or resources, I will be posting links here. Organic Food Isn’t Better, So Why Do Moms Keep Buying It? An Agricultural Scientist Doesn’t Buy Organic. Here’s Why.